This unit discusses Canada's role in the First World War, and how it contributed to Canadian identity. It will address the issues of Canadian sovereignty, French- English relations, and the Aboriginal contribution to the war effort. The unit will also examine how, during this period and because of the war, the economy, the status of women, and immigration policy all changed. This unit will address the following questions: How did Canada exert and gain sovereignty during this period? Why is it significant that Canada's sovereignty was recognized by other nations? How did the political climate of Canada change during this period of time? Why were these changes significant? How did the economic state of regions of Canada, Canada as a whole, and the world, influence events and attitudes in Canada during this time? How have Canadian attitudes towards human rights changed since the 1920s? 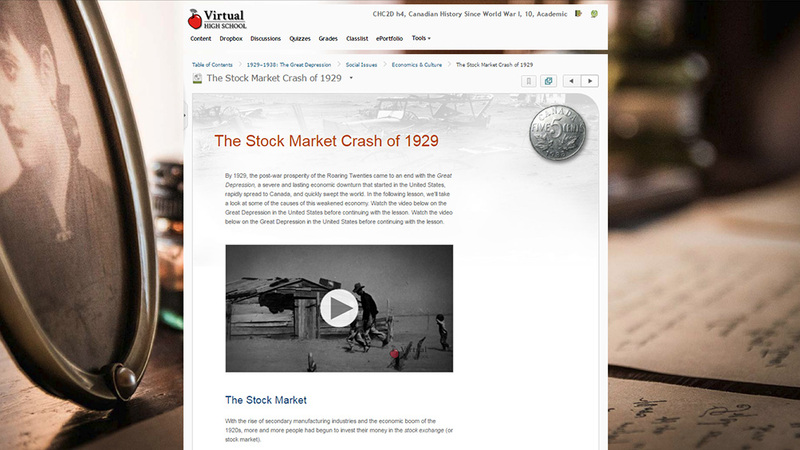 This unit examines the ways in which the Great Depression affected Canadians' daily lives, as well as the changes in Canadian domestic and international policies. This period marks the rise of Socialism, the Cooperative Commonwealth Federation, and new social welfare policies. In keeping with the course's larger themes, this unit also addresses the issue of Canadian identity and sovereignty with the introduction of the Statute of Westminster (1931). The Second World War was a major turning point in Canadian (and World) history. WWII was the deadliest conflict in human history. This, in addition to the mass slaughter of civilians during this time, led to massive social, political, and economic changes in Canada, and throughout the world. International organizations were implemented to make sure atrocities, such as the Holocaust, would never occur again. Citizens felt entitled to more rights and a higher standard of living after what they had contributed to their country. This led to the formation of many human rights organizations, and the implementation of new social welfare policies. This unit examines in greater depth the social, political and cultural themes from the previous unit. During this era, racist policies were removed from immigration orders, the fight for equal pay for women began in earnest, and status Aboriginals were finally given the right to vote without having to give up being status Aboriginals. Refugees, once turned away from Canada's borders, entered by the hundreds of thousands. However, despite these improvements to human rights, conflict continued. The Cold War started immediately after WWII between western capitalist democracies and eastern communist dictatorships, both sides testing nuclear bombs in Korea, Vietnam and elsewhere. This unit deals with the era in Canada that spans Trudeau's time as Prime Minister (with an interlude in 1979 of Joe Clark's premiership). It was a time when Québec nationalism turned to sovereigntism, when the West's wealth grew rich through hard work in the oil fields, and when Acadians fought for access to the same services as their English compatriots. Canada was forever changed directly by Trudeau's changes, like his policies on bilingualism, multiculturalism and environmentalism. The Charter of Rights and Freedoms, which Canadians celebrate and enjoy to this day, is also a legacy of Trudeau's government. On the other hand, much of modern history can be seen as a reaction to Trudeau's policies. The Québec referenda in 1980 and 1995 were held partly in response to Trudeau's hardline federalism. Civil rights groups still debate his response to terrorism in 1970, and financial analysts still debate his attitude towards the country's money. This unit examines the theme of French-English relations with a discussion of the patriation of the constitution and the failure of the Meech Lake and Charlottetown accords, and the Québec referendum in 1995. It will also study the fall of the Berlin Wall in 1989, and the end of the Cold War. With only one super-power left in the world, politics became, in some ways, more complex. The European Union was born; Iraq became an enemy state to the West; Yugoslavia and Rwanda became notorious during periods of intense violence. Undoubtedly, the greatest sea change was the terrorist attack of September 11, 2001, and the world's response to it, which continues to this day. For this assignment, students will produce a virtual museum (digital or online) exhibit on a specific topic in Canadian history. The exhibit can be presented via website, blog, PowerPoint, Prezi presentation or another media form (to be approved by the student's teacher). This assignment is worth 10% of the overall grade. developing historical literacy skills by analysing and interpreting evidence from primary and secondary sources.